I'm beyond excited to begin what will be a series of posts here on the blog. I currently dabble with yogurt and kefir and kraut, but my new series will include regular articles revolving around ALL THINGS fermenting and will hopefully get lots of my friends excited and ready to give it a try. Each post will be different; a method, a recipe, a quick science or history tidbit--all things fermented and lots of delicious food. Since I'm pretty new to fermenting at home, you guys will get to learn along with me, each step of the way. Some of you may already be fermenting your little hearts out--I can picture you like mad scientists in your kitchen labs--others may be dabbling like I am...and some of you may have never tried it at all. Since there is so much variety and possibility with ferments, I think ALL of us will be able to learn from each other in this series no matter what our current skill or interest level. I for one have decided to dive into this ferment madness with abandon and I can't wait to share all the results! Now, this post is supposed to be quick, because it is just a fermentroduction, so let me get to the bare bones like a proper introduction should. We'll get deeper into the nitty-gritty in later posts! kraut, yogurt, and water kefir. It sounds kind of yucky, right? But fermenting foods is a timeless activity that helped our ancestors preserve food. Quite honestly, most ferments occurred by accident. By learning to create and control ferments, many societies learned to keep their food from rotting and decaying by utilizing 'good' bacteria. The good bacteria grows in the food medium you introduce it to, while also increasing the availability of the vitamins and nutrients in the food itself. You are probably most familiar with ferments like yogurt, cheese, vinegar, and sauerkraut. Some researchers argue that the processes used to make these ferments on a huge scale (so that you can buy the products at the store) are not nearly as effective at creating good bacteria as ferments made at home. This mostly has to do with the fact that ferments are alive, and their benefits come from being alive. On an industrial scale, it's difficult to keep cultures alive and plentiful in fermented foods. Which is why fermenting your own foods and eating them while they are healthy and fresh and alive is a good habit to get into! Ferments in their most simple form can be created by harnessing wild bacteria that is already present all over every object we touch and see (often using salt to prohibit unwanted bacteria). Think sauerkraut--in most cases it involves only packing shredded cabbage and salt into an airtight container and letting it go. However, most most home fermenters use some kind of starter at least some of the time to nudge the specific culture they are looking for--starters like whey, 'mothers' and scobies, store-bought starters, or previous ferments (like my 'continuous yogurt' that I make, using the same culture again and again for new batches). There are different kinds of bacterias and processes involved in the world of fermentation, but we can save some of that for future posts. To preserve your harvest if you garden! While it's helpful to have another preservation tool under your belt beyond canning and freezing, the main reason you should start fermenting is because it's healthy. Like super-duper, awesomely healthy. All those 'good' bacteria that are cultivated in fermented foods? It turns out they are miracle-workers for our digestive and immune systems. Our bodies are made up of mostly bacteria. Some sources say our guts are around 80% bacteria! Some bacteria helps us, and some don't, and there is literally a battle going on constantly between the good and the bad. Eating fermented foods sends in loads of reinforcements of good bacteria (also called probiotics) to help fight the battle and stay healthy. You are probably familiar with people taking probiotics as a supplement, because the news about their benefits is spreading like wildfire lately. Fermenting fresh foods will allow you to cultivate your own little army of probiotics, while creating delicious foods and preserving some of your garden harvest at the same time. 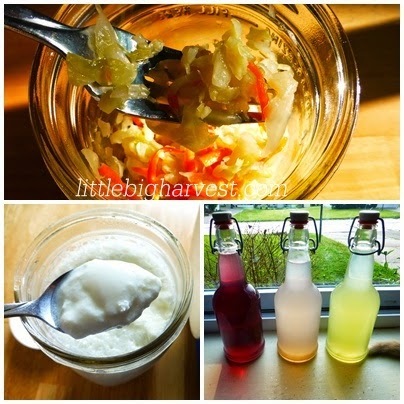 WHAT ARE SOME COMMON FERMENTS? Check out Part 2 in the series: Salt and Fermenting: Why? What kind? How much? Try This Recipe for Kohlrabi Hotsticks! Perfect for newbies! 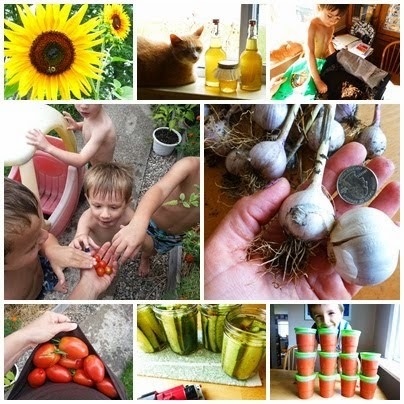 Quart Jar Kraut and 20+ ways to eat it! *If you are feeling really intimated about fermenting (I know I have plenty of trepidation),you might consider investing in some tools. While tools are not necessary at all (just a container and a lid will do), they sure have helped my confidence! Pictured below are tools that I'm testing for Fermentools.com (I'm NOT an affiliate). I LOVE these tools! Click here to read more about Fermentools. Awesome fermentroduction! Really looking forward to the rest of the posts.. I've been wanting to learn more about fermentation! Great idea for a post series! My fermentation experiments have been disappointing thus far, I'm looking forward to see how yours turns out! So happy to find your blog and this series. Can't wait to try new things. At the moment, my small home smells like yeast because I have several different bread and cake starters growing in the kitchen. I love when fun and healthy meet. Looking forward to the rest of the series. Yes! Thanks for doing this. I do a bit of fermentation (kombucha, veggies, etc) but I am really looking forward to learning along with you! There are so many recipes, I'm having a hard time choosing! ;) I'm beginning to think you can ferment just about ANYthing, ha. Do you love kombucha? I've been wanting to start with that forever. I may have to get tips and advice from you! I am so excited about this fermenting series! I've wanted to try out fermenting for the longest time, but I'm so worried about doing it wrong and making my family sick! Do you have any books you'd recommend to help make the fermentation process a bit less scary?